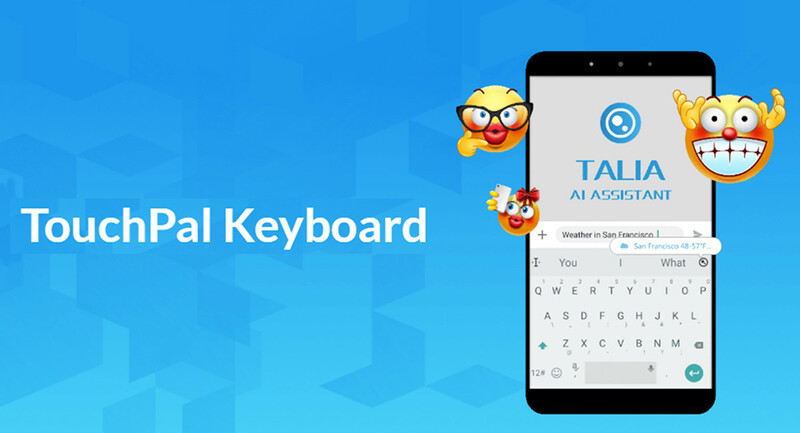 TouchPal is one of those names that have accompanied the mobile sector for so many years that it is difficult to establish the exact moment in which we began to hear about the brand. Year after year, Touchpal has maintained a pulse in the sector, always finding itself as one of the most popular keyboards for Android, and has continued to attend events (such as the Mobile World Congress, where it usually has one of the most colorful stands in the feria), in which it takes advantage to explain its continuous innovations. Today we have to talk about Talia, the Artificial Intelligence that has been introduced in its application. The TouchPal Keyboard Pro mobile keyboard has just come out of the beta version and it is now possible to download it on Google Play (also on iOS ). The app is free, financed with advertising, but offers the option to subscribe to a Premium account for $ 4.99 a year and stop seeing any ads. One of its great novelties in this latest version is its Virtual Assistant, Talia. Talia is an assistant with Artificial Intelligence that suggests automatic quick answers that are based on the context of the conversation . Quick Replies calls in services such as Gmail, appear on the screen as they send you messages. They are displayed in packages of up to three alternatives in a comic style bubble. You only have to touch one of the options to answer without having to write anything else. Talia not only helps during the writing. Its functions include mathematical calculation, that is, the keyboard can function as a calculator. In the text box you can also request unit conversions and, if you type the word “weather”, it will offer you the most recent weather information, so Talia turns the keyboard into a digital Swiss Army knife. One of its most interesting novelties is the Swift Paste service, a tool with which any copied text appears later in one of Talia’s bubbles once you click on a new text field. Ready to hit with a single touch. In addition, their menus offer GIFs related to some of the expressions we type on the keyboard, so that instead of writing “LOL”, we can click on a relevant GIF that best describes the reason for our good humor. To all this we must add the function AR Emoji, a tool with which the service is able to recreate our facial expressions using only the resources of the main camera and, then, transferring the information of the face to drawings of those already has the same keyboard. Talia has her own feed that is displayed by touching the icon. It includes current information, recommendation of games that you can run in the same environment, and a review of all your skills as a virtual writing assistant. In addition, we are releasing phrases to encourage us to play. The first versions of Touchpal, based on T + technology, already had predictive writing and gestures on screen to become one of the fastest keyboards that existed in the market. A promise that he has wanted to maintain over the years. With the neuronal language model with which TouchPal works, the keyboard is capable of autocorrecting typographical errors, or only marking them in red if you configure it, and predicts the next words that you will use with a quite remarkable precision. This quality is due, according to the company, to that its artificial intelligence has been trained with more than one hundred million sentences to understand the relationship that exists between the words used that allow you to propose then the best option. Predictions based on neural networks, multi-language support, search for GIFs, multiple personalization options, gesture writing … Touchpal has never stopped innovating and contributing new ideas to the world of mobile writing, and that has even led to be the default keyboard trusted by some phone manufacturers, such as HTC.